Situated between the Atlantic coast and Mediterranean, Toulouse is a vibrant holiday destination renowned for its fine food and red brick architecture. Toulouse accommodation is scattered throughout the city centre and fringes, offering easy access to the region's most popular attractions. 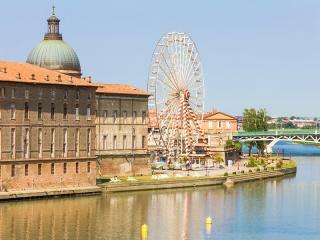 Spreading out from Capitole Square's café-lined arcades and across the River Garonne, Toulouse accommodation is surrounded by iconic sights like Place St-Sernin, the Basilique St-Sernin, the Port Lauragais, Canal du Midi, Les Abattoirs contemporary art gallery, National Space Centre and more.